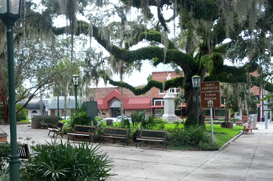 Spring Hill is located about 40 minutes north of Tampa, Florida on the beautiful Nature Coast. The population is around 95,000 and it was founded in 1962 as a master planned community and primarily developed by the Deltona Corp. Although it has expanded recently, “Spring Hill” has come to be referred to as the area north of Spring Hill Drive to State Road 50 and west of Barclay Ave to US-19 To the west of Spring Hill is Hernando Beach and to the northeast is historic Brooksville. Spring Hill is easily accessible via the Suncoast Parkway toll road running south to Tampa and dead-ending at the airport. The road was constructed in 2001 and has allowed more young professionals to make the daily commute to the Tampa Bay Area. The last 9 years has seen considerable growth and now Spring Hill has a number of shopping areas, restaurants, schools, housing communities and hospitals in the county to cope with the growing population. There are also a number of state parks, golf courses, beach areas and much more for its residents to enjoy.